This is an enhanced reprint of the most current edition. 80% of the existing images in the main section have been replaced and there is a new appendix containing over 100 coins that were not included in the last edition (this is the first ever attempt to update the information for over 30 years). Where there is new information, the main text contains references to the new appendix and some of the rarity ratings have also been adjusted. This new book is also slightly larger than previous versions, in an attempt to improve the quality of the images and ease of identification. In this book Mr Freeman articulately describes the differences between the obverse and reverse types of the subject matter. Where relevant there are tables of the possible combinations of reverses and obverses, often many combinations even for a single coin date. Proofs in bronze and other metals are also listed. Alterations to the dies, including changes to the date punches and major overstrikes resulting in letters/digits appearing to be struck on other letters or digits. 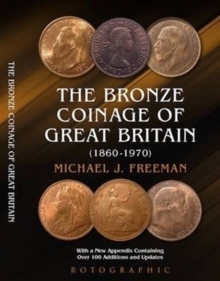 Over 1000 different coins are listed, including patterns (both official and unofficial).Decimal coins have been removed from this edition (they were previously only listed from 1971 to 1983) and there are no values in this book, it is solely concerned with the varieties of bronze coinage. Each coin type in the main section and some of those in the new appendix are, as mentioned above, assigned an estimated rarity on a 41 point scale from 'believed unique' to many millions made.